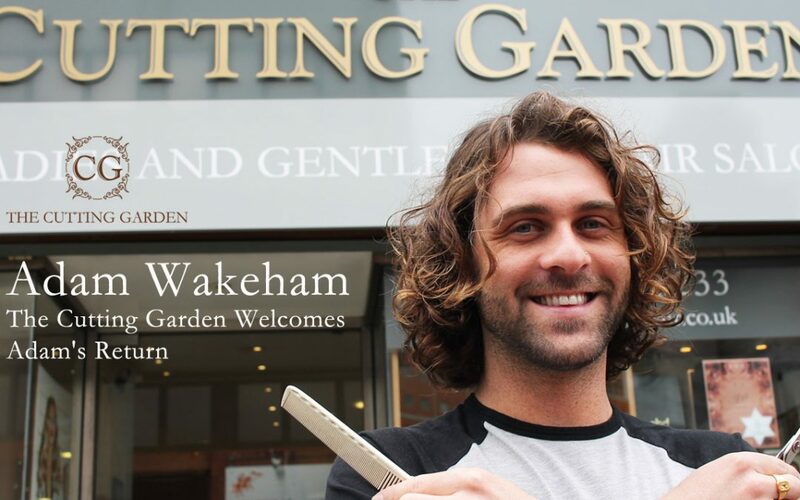 Not long ago, we were delighted to announce that Adam Wakeham had returned to The Cutting Garden. Adam is a familiar face for many of our regular clients as he started his hairdressing career with us almost 10 years ago as a trainee. We took some time to chat with him and find out what he’s been up to and what the years have taught him. But what do you do with somebody who really doesn’t know what to do with their hair? “It’s very difficult. You have to advise on what they have and go from there” he says. “You explore ideas with them until eventually you do find something.” That’s where his experience comes in. Having helped so many ladies find their perfect style has given Adam a deep well of knowledge from which to draw. He explains that the secret is to find a style that matches an individual’s personality. Adam takes a personal pleasure in helping his clients look their best. Sometimes that can mean saying “No” to the wrong style in order to help them find the right one. “Oh, I’m very blunt. I do use the word ‘no’ quite a lot when a client has unrealistic expectations. If I were to give someone a style which meant they looked silly or one that just didn’t suit them, it would have my name attached to it” Adam is very aware of the fact that his reputation is carried on the heads of his clients. The pride and joy of seeing clients transformed by their new style is evident when he speaks. There is clearly more at play here than cutting and curling. Hairdressing is a fast-moving industry. Styles change constantly and new trends emerge all the time. Since Adam began his career in 2008, he has seen a lot change. This is one of the reasons why it is so important to talk to your stylist and discuss the issues you have with your hair. Adam, like all of the stylists at The Cutting Garden spend a lot of their time keeping up with the latest developments and technologies of hair care. Whereas, once a upon a time options for troublesome hair may have been limited, our stylists now have a range of treatments and courses that you may not be aware of. The Olaplex treatment is only available in-salon, and all of our colourists here at The Cutting Garden love it because of the terrific results it can produce. Just ask for Olaplex when booking your appointment. Adam is a familiar face for many of our clients because he began his hairdressing career with us nine years ago and he developed his key skills here. Over the years, his career took him to other salons where he added to his experience and abilities. Now, he has chosen to return to the salon where he started. We asked Adam why chose to return. We are delighted that Adam has returned to The Cutting Garden family. His enthusiasm is infectious and he has already started sharing his new skills with his fellow stylists. For Adam though, growth and development is something that never stops. He is currently adding barbering qualifications to his skill set. After that, Adam feels it is time to build on what he has learned over the past few years. He is an older, more mature person than when he left us on his adventures, and this maturity shows in his client relationships and in his styling too. He would like to run his own salon eventually, but feels in no rush to get there. At 27 he is still young enough to be fired up with enthusiasm for his chosen work, and mature enough to know that he still has much to learn about running a salon. He will definitely get there, and we are happy to help him on his journey. Adding barbering skills has been a pleasant challenge for Adam. “There are some things that are done very differently from hairdressing. For them, I have to take my hairdressing brain out and put my barbering brain in” he says. Men’s hair styling has changed dramatically over the past few years. For many years, beards were pretty rare to see, but now beard care is a massive trend. Whilst the large lumberjack style beards may be on the decline, Adam feels that beards are here to stay for some time to come. Far from simply being part of the hipster look, it has become an important expression of individual style for many men. Adam has a large number of clients that have followed him from salon to salon during his career. One of the reasons for that is his strong relationship-focused approach. He values his relationships with his clients and is often stopped in the street by clients who chat with him. It’s a friendliness that is core to his personality but also central to the way that he styles hair. He genuinely cares about the happiness of his clients and wants them to feel great because their hair looks great. What advice would he give to young hair stylists in Plymouth? Building a clientele is tough for young stylists, so to do that he suggests specialising in one thing that you can become known for. Be a great all-rounder, but pick one thing that you can become really, really good at and work at it. Adam feels like his enthusiasm for his career is even stronger than before. He is more driven than ever before to do his best and improve constantly. Call us on 01752 223233 or book your appointment online.